2019 1,Year 10 to 12 Student Prerequisites Planning Document. Please complete and submit with your Web Preferences receipt. 2019 Web Preferences - Student Access Code & Password will be provided for you. Via student VSC email on Wednesday 25th of July. Please complete your online Web Preferences and print out a Subject Selection Receipt. You must have your receipt signed by your Parent/Guardian, Student Managers & Pathways Team. Please return your final signed completed copy to the Year 9 Student Managers Office by Friday 03rd August, 4.00pm. 2018. RESOURCES:To help you make an informed decision. Year 09 into 10 Pathways Subject Selection Expo Presentation, July 25 2018 upload Thursday 26th July am. The 2018 VTAC Year 11 and 12 Guide helps students research tertiary courses and leads Year 12 students through the application process. All Victorian schools are sent one copy for each Year 11 and Year 12 student. How to use Course Search CourseSearch lists over 1,700 courses offered by VTAC. It’s a powerful search tool and contains essential information needed during the application process. CourseSearch is available on the VTAC website (vtac.edu.au/ coursesearch) or the VTAC App. all the course and institutional information contained in the Guide. All Victorian schools are sent one copy per Year 12 student. 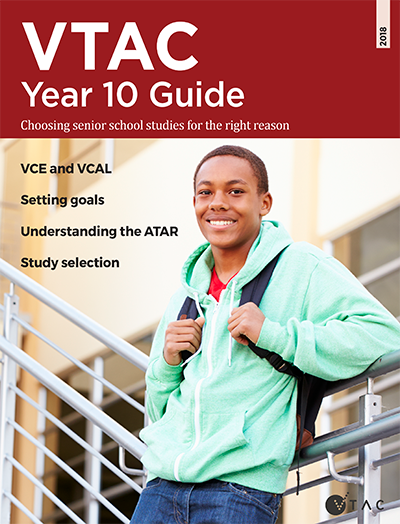 The VTAC Year 10 Guide provides a snapshot of the tertiary system for year 10 students, explains the terms they need to be familiar with and debunks some of the myths commonly associated with choosing subjects by using real life examples.